The following post by Rev. Cynthia Cain was first featured by Standing on the Side of Love. 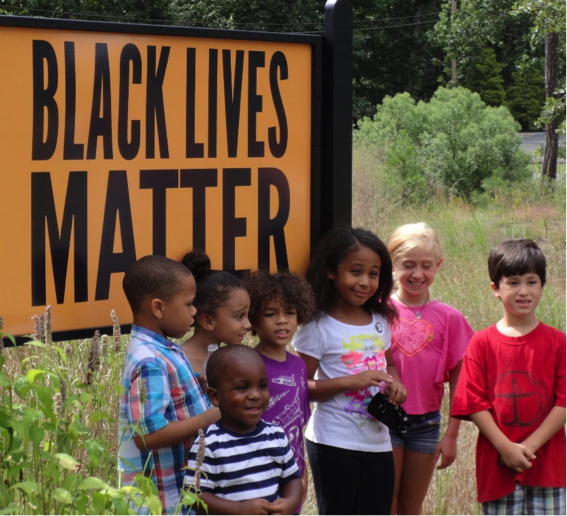 Dedication of Black Lives Matter sign on August 23, 2015. Sign was defaced 10 days later. 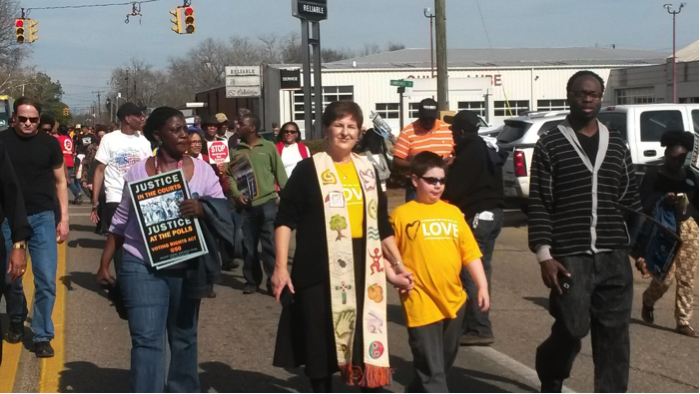 Not long after I returned from the events in Selma, marking the 50th anniversary of the historic march it became clear to me, even though I was an interim pastor at the UU Congregation of the South Jersey Shore, that there was a compelling need at this time for a renewed civil rights movement, and for liberal congregations like ours to speak out and stand up, and we could no longer stand by in silence. Most important among the narratives and images that I brought back from Selma were the words of Mark Morrison-Reed, when he told us that it all begins with relationships; the powerful teachings of Opal Tometi, one of the founders of the #BlackLivesMatter movement; and the warmth, affection, and tenderness expressed by the families of James Reeb, Jimmie Lee Jackson, Clark Olsen, and Orloff Miller. This great love, a love for humanity, for justice, for goodness, a genuine faith and a passion for what is best in humanity permeated the time we spent together. Walking toward that bridge amidst a throng of thousands, holding the hand of my adopted boy Seth, a child who lives with autism, I felt that day part of a great sacrament. I felt that a promise was made, to carry that spirit of love back to every town and city from which we had come. Soon, we formed an Anti-Racism Task Force. We talked about what we might do: study, have forums, outreach, a partnership with a mostly Black congregation. 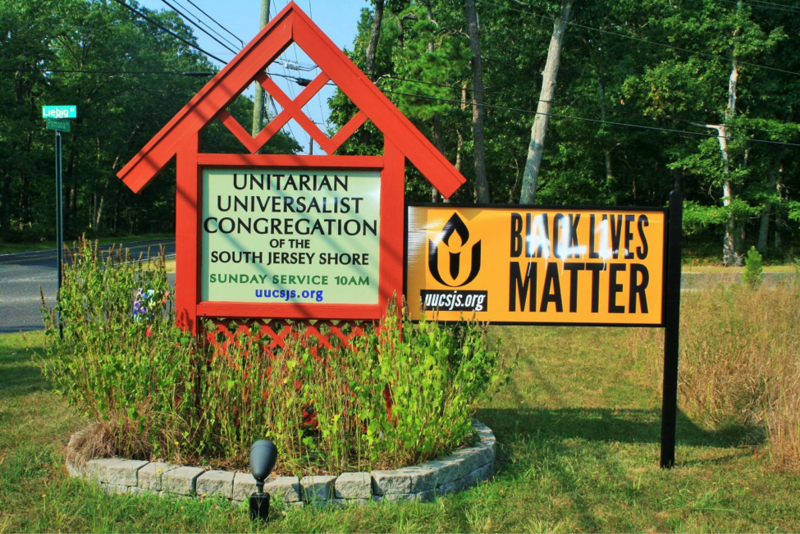 I knew that other UU congregations had put up banners saying, “Black Lives Matter,” so I threw out the query, almost as a kind of provocative idea: Would you suggest we post a sign? How about protesting by the road if there were an incident in this community? It was a surprise, then, when the team members, unanimously, said, by all means. And since this team consisted of some of the founders and most highly respected members of the congregation, we stepped out, with Love. It wasn’t just an idea, but something I felt deeply embodied in these ten or twelve people: they meant it. I was out of town when the Board unanimously approved the sign. I was at General Assembly when the task force planned and held a beautiful vigil for the victims of the massacre at the AME Church in Charleston the Sunday after the shooting. But I had returned by August 23rd when we had an afternoon ceremony, attended by new allies and friends in the community, to dedicate our sign. The relationships we had begun to build already showed. I believe that we lived into our best selves that day. Yes, we have been viciously attacked on Facebook and threatened. Yes, the sign was defaced, scrawled over with white paint by vandals. Yes. We hung it back up after we found it could not be cleaned. Each decision we have made has been to respond with love, not fear. 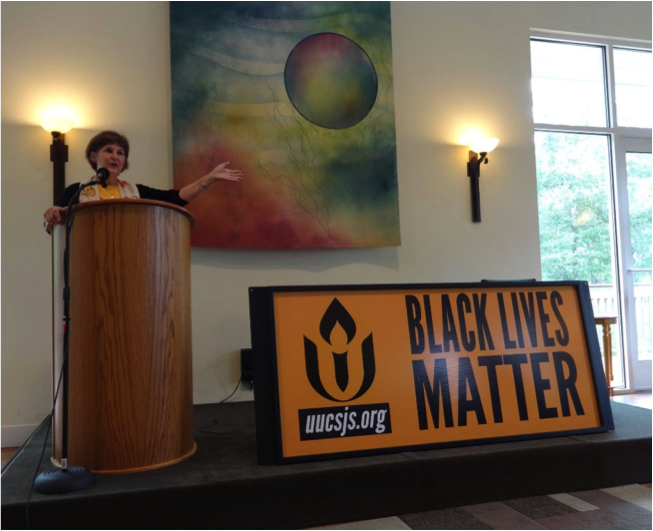 If your congregation has, or is interested in, putting up a banner check out this resource page on The Power of the Black Lives Matter Banner. I refuse to listen to the messages of hate and scorn. I refuse to listen to the rhetoric that calls “Black Lives Matter” a hate-filled, cop-hating movement. For us, they are three words that send a signal to the world: we care, immensely, and we intend to live into these words with actions that show it. Indeed, our task force has worked diligently to build relationships with law enforcement, and to learn more about their challenges as well. Task Force members & Rev. 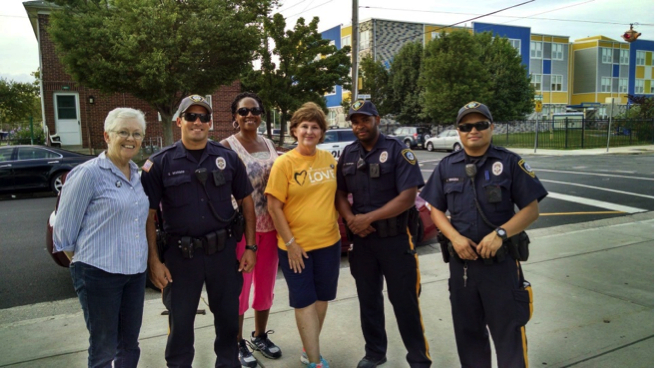 Cain with Atlantic City officers on weekly walks through the neighborhoods of AC. We have joined the ACPD & community organizers all summer. I sincerely believe that it is the nefarious design of institutional racism in this land, in which all white people are complicit, that has kept many of us from deep and genuine encounters with people of color. And it is only through proximity, and through building relationships, in which we listen, and open our hearts to love, that this will begin to be reversed. I have learned this: as you build genuine relationships, you will stand up. As you make a stand, and take a stand, genuine relationships will follow. But you have to show up, and show up, and show up. This isn’t a flirtation, or a whim. White people, even liberals, have deceived, let down, and disappointed People of Color, and Black people specifically, in organizing for racial justice throughout history. Don’t go in unless you intend to stay in relationship. And once you know, really know, the truth, you will never be complacent again, until all are free. I feel so blessed to be a part of Unitarian Universalism in this time, when we are awakening to the new Civil Rights movement, and when we can be the people who show up, and stand, and move, with Love. Our sign (two sides) on Pomona Road across from the entrance to Stockton University. We replaced the sign with damage after it could not be cleaned, feeling that was a “teachable moment” and people needed to see how far some were willing to go to shut down this conversation. We are currently planning forums with a primarily Black Methodist congregation in AC.